Rita Mae Neylon, age 93 of the Villa St. Benedict Community of Lisle, formerly of Palos Hills, IL, passed away peacefully, Monday, March 25, 2019 at her home. She was born September 18, 1925 to her loving late parents, Michael and Nellie Neylon. Beloved aunt of Patricia (William) Meier, Denise Neylon, Dennis (Sharon) Neylon, Bryan (Joann) Neylon, Michael (Marja) Neylon, Patrick (Lisa) Neylon. Dear great-aunt of many nieces and nephews. Loving sister of the late Nellie O’Brien and John Neylon. Rita Mae Neylon was born September 18, 1925 in Whiting, Indiana. She was the third of three children born to Nellie and Michael Neylon. Rita's parents emigrated to the United States from Ireland, Nellie from Tulabrack, and Michael from Ennis, both in County Clare. Rita's parents settled in Whiting, Indiana. Her father became a master mechanic and worked for Standard Oil Company. Michael went on to become a City fireman. In 1928 the Neylon family moved to Chicago and bought their own business, a bathhouse. Both Nellie and Michael worked in their business. The baths were sulphur vapor and proved to be a popular treatment for arthritis. Among their prominent customers was the Daley family. Rita graduated from Calumet High School in 1943 and began working as a telephone operator for Illinois Bell. Her career spanned almost 40 years, moving to jobs of increasing responsibility, ultimately retiring from a management position in what is now known as Ameritech. Rita and her mother Nellie lived in the family home at 87th and Sangamon in Chicago, and then in Blue Island. When her mother passed away in 1973 Rita purchased a condo in Palos Hills and lived their for 30 years. 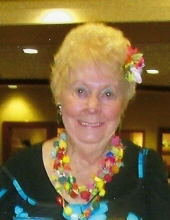 She served as President of the condo board for ten years and Treasurer for eight years. In 2014 she decided to sell her condo and move to a senior community. Villa Saint Benedict has been her home since. She has served on a variety of committees and has always enjoyed adding her two cents to the discussion. Rita is the beloved Aunt to her brother Jack's and sister-in-law Betty's children Dece, Denny, Mike, Bryan and Paddy and her sister Nellie's daughter Patty. Patty bestowed the nickname "Mamie" as a small child. Mamie enjoyed being the Great Aunt to twins Maeve and Brian, Sam, Nick, Caitlin, Megan, Stefan and Rikard. Rita's passion in life was travel. She and her best friend, sister Nellie, traveled the world, and Mamie has numerous albums to prove it. They took at least two trips per year which encompassed their ancestral home, Ireland, plus Italy, Scandinavia, South America, North America, Spain, Greece, Egypt, Africa, China, and Japan. Their preferred cruise line was Cunard and their favorite ship was the QE2. Rita has embraced life and the people in her life fully. We will miss her quick wit, her smile, her feisty personality and the warmth she has shown to everyone she has encountered, family and friends. Rita was the unofficial welcome wagon at VSB and the stories of her warmth and kindness to new residents is legendary. And of course let us not forget her dancing! In lieu of flowers, memorials to Habitat for Humanity of Illinois, 931 W. 75th St., Suite 137-110, Naperville, IL 60565. Visitation: Thursday, March 28th 4:00-8:00 PM at Friedrich-Jones Funeral Home & Cremation Services, 44 S. Mill St., Naperville, IL 60540. Additional Visitation: Friday, March 29th 10:00-11:00 AM at Sacred Heart Monastery Chapel, 1910 Maple Ave., Lisle, IL 60532. Mass of Christian Burial will follow at 11:00 AM at Sacred Heart Monastery Chapel. Interment will be private at Holy Sepulchre Cemetery, Alsip, IL. To send flowers or a remembrance gift to the family of Rita Mae Neylon, please visit our Tribute Store. "Email Address" would like to share the life celebration of Rita Mae Neylon. Click on the "link" to go to share a favorite memory or leave a condolence message for the family.